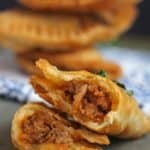 This Delicious Ground Turkey Empanada Recipe will become your fave go to snack or game day food! They are filled with flavor and the flakiest crust ever! Combine the flour and salt in your food processor and pulse a couple of times. Add butter and pulse until it resembles coarse meal. Lightly beat the eggs with the water and vinegar. Add to flour crumbs and pulse until dough forms. Turn the dough onto a lightly floured work surface and gently knead for 2 minutes. Wrap the dough in plastic wrap and refrigerate for 1 hour. In a large skillet, heat oil over medium heat. Add onion and garlic and cook until onion softens. Add ground turkey, crumble and cook until pink is gone. . Drain of grease. Stir in tomato paste then add stock or broth and paprika simmer until the liquid almost evaporated, about 3 minutes. Season to taste with salt and pepper. Remove from the heat and let cool. Roll the dough on a generously floured work surface until it’s about 1/8 inch thick. Cut the dough into 3-inch rounds with a floured biscuit cutter or glass, stamping out as many rounds as possible. Roll out any dough scraps and cut out additional rounds if possible. Brush any excess flour from the dough rounds. Preheat the oven to 200°F (93°C). Pour enough oil into a deep-sided pot to reach a depth of about 1/2 inch and heat until it registers about 325°F (163°C) on a deep-fry or candy thermometer. Fry the empanadas in small batches, turning them once, until browned and crisp, about 2 minutes per side. Transfer the empanadas to paper towels or a brown paper bag to drain for a few moments, and then transfer to a baking sheet. Place the fried empanadas in the oven to keep warm while you fry the remaining empanadas. Serve at once.